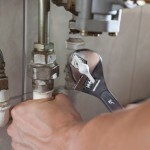 Differences Between a Residential and Commercial Plumber | A Step Above Plumbing Inc. Differences Between a Residential and Commercial Plumber | A Step Above Plumbing Inc.
• Homes are smaller than commercial buildings and have less traffic. A home’s toilets, sinks, and showers are used by a limited number of individuals compared to the large number of people who will be washing hands, going to the bathroom, and showering in a commercial building. With so many people using these facilities, the water pressures need to be set higher than in a home. • Increased usage means that the materials in commercial buildings need to be larger and more durable than those used in a home. • Residential and commercial plumbers need to know the different codes for different types of buildings, so that they’re ensuring total safety. Both the structure itself and the people using it are endangered if a plumber isn’t fully qualified. Knowing some of these differences will help you determine what type of contractor you need to hire for the work that you need done. It is also acceptable to talk with several different plumbers before deciding which one is the best fit for your situation. You’ll get the best quality work by hiring a residential plumber for a home and a commercial plumber for other properties.